Just two months into 2017, employment data is ushering in business confidence and surpassing expectations for steady job growth. 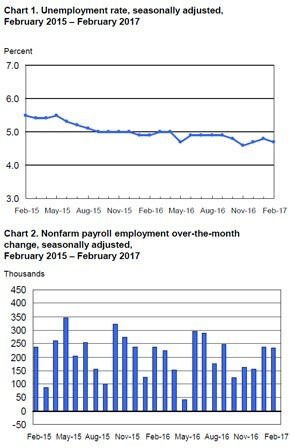 In February, employment in nonfarm payroll grew by 235,000 – with the largest increases seen in construction, private educational services, mining, healthcare and manufacturing, according to the Employment Situation Summary released by the Bureau of Labor Statistics (BLS). Gains in the construction sector rose by 58,000, particularly for civil engineering construction and specialty trade contractors. The BLS also noted that, over the past six months, 177,000 construction jobs have been added. February was also a solid month for manufacturing employment, an industry that added 28,000 jobs last month and 57,000 since December 2016. This includes food manufacturing and machinery. Job gains in ambulatory healthcare services contributed to the 27,000 employment increase seen in the healthcare industry last month – a sector that is averaging 30,000 jobs added monthly. The uptick in professional and business services roles continued, with 37,000 new jobs added. Retail trade employment experienced losses of 26,000, after gaining 40,000 new roles in January. There was very little change in other major industries including wholesale trade, transportation and warehousing, information, financial activities, leisure and hospitality, and government. According to the BLS report, the unemployment rate changed very little for February 2017 resting at 4.7 percent. However, it is slightly less than it was at this time last year, when it was 4.9 percent. These findings echo the data released in a report earlier this week from payroll processing company ADP. The research showed that an explosive 298,000 private-sector jobs were added last month, much of which were attributed to professional and management services, as well as construction and manufacturing. The reading was especially promising because it suggested a healthy employment increase spanning the economy. According to LifeZette, January and February represent the two strongest consecutive months for job growth since August and September 2015. In January, the U.S. labor market added 227,000 jobs, surpassing the forecast of 180,000. With the labor force participation rate being 63 percent and the employment-population ratio 60 percent, February remained pretty steady from the previous month – with notable gains in certain areas. In light of the favorable February jobs report, it is very likely that the Federal Reserve will raise interest rates during next week’s meeting. Diane Swonk, founder and chief executive of DS Economics, told the New York Times, “They’re ready to go,” referring to the central bank’s expected vote next week to raise rates from their historically low levels.